At Tsuruya Yoshinobu’s “Kayūchaya” you can enjoy freshly made Namagashi, rare even in Kyoto which has an array of Wagashi traditional Japanese sweets shops. Namagashi are a type of Japanese wagashi sweet, which are beautifully designed and often contain fruit jellies or sweetened bean paste. When you sit down at the counter, one of Tsuruya Yoshinobu’s skilled confectioners will show you the process of making the Namagashi, right in front of your eyes. Seeing the ingredients called "Konashi" be turned into a beautiful dessert right in front of your eyes is a definite highlight of the Kayūchaya! Also remember to pay close attention to the brilliant hand movements of the confectioner, as they are true masters of their trade. On top of that, not only can you enjoy watching the sweets making process, you can also enjoy speaking to the confectioner themselves. For anyone interested, why not try and ask them about their traditional Japanese Wagashi sweets. In addition to the Kayūchaya, in the Oyasumidokoro restaurant next door, you can also enjoy the refined sweetness unique to long-standing Wagashi confectionery shops while taking in the beautiful greenery and pale white sand of the Chatei (Japanese tea room garden). Tsuruya Yoshinobu always has 2 different types of Namagashi available. When you sit down, the confectioner will show you samples of each Namagashi and explain them, so you simply need to choose one of the two. 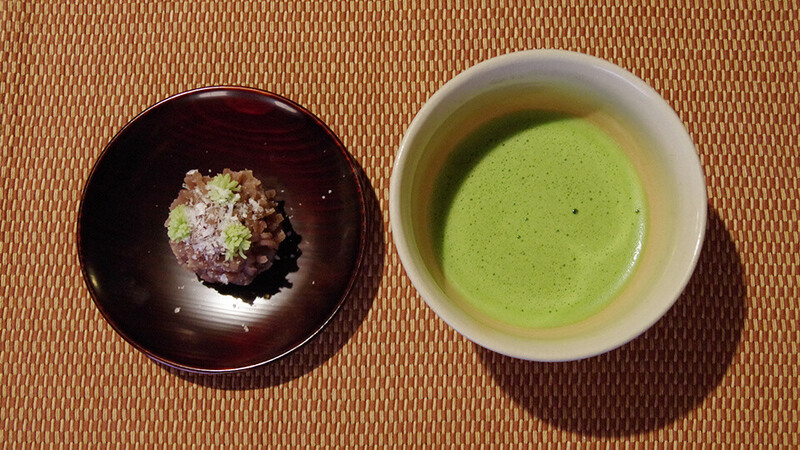 The menu changes around twice a month, so you can enjoy a different Namagashi every season. After you’ve chosen, the confectioner will explain the Namagashi as they make it; however, it only takes a few minutes before they've completed the beautiful dessert! This fully immersive demonstration will make you forget to even blink as it engrosses you. Please enjoy the unique smoothness and refined flavors of the freshly made Namagashi with some flavorful and bittersweet Matcha green tea! This dish is a warm Zenzai, perfect during the colder seasons. 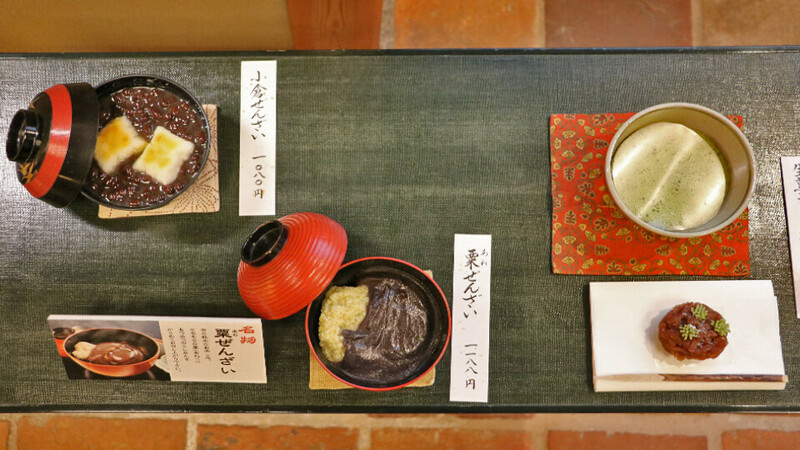 Zenzai is a dessert made from sweet Anko red bean paste covered Mochi (Japanese rice cake). So, usually Zenzai would contain Mochi; however, at Tsuruya Yoshinobu, they have swapped out the Mochi for a steamed millet called Awa. Awa is a grain that Japanese people have eaten since ancient times. Its soft texture, different to that of Mochi, will have you hooked. Enjoy the Awa with a big helping of the mildly sweet Koshian (smooth red bean paste) that sits on top. Then try cleansing your palate of the sweet Koshian with a pinch of salty dried Kombu seaweed that comes on the side. This Kinako Jelly and Matcha Ice Cream dessert contains an unconventional jelly made of Kinako. Kinako itself is a powder made from roasted, peeled and then ground soybeans. It has a characteristically gentle sweetness and aromatic flavor. Of course, each aspect of this dessert is delicious when eaten on its own, but the aromatic and firm Kinako jelly, the bittersweet Matcha ice cream and the fat Tanba-Dainagon azuki red beans go superbly together. This Kinako Jelly and Matcha Ice Cream dessert is refreshing, and especially recommended for summer. You will most likely get the opportunity to try some Matcha green tea at this store, but please don’t worry too much about the proper etiquette and relax and enjoy it. There are models of the food outside the restaurant, so please have a look at them if you’re unsure about what something is when ordering. This was my first time seeing a demonstration of Namagashi sweets being made, but I was way more impressed than I thought I would be! Even with the sweets that you’re used to eating, having a confectioner offer up freshly made ones, which they skilfully crafted right in front of your eyes, is a very extravagant feeling. As well, their other dishes — including Zenzai and Kudzu Kiri — are all incredibly refined and delicious. You might say that it’s as to be expected at Tsuruya Yoshinobu, but there’s no doubt that every single one of their dishes will cement itself in your memory. Tsuruya Yoshinobu’s Oyasumidokoro has plenty of seating and they are very quick at getting your desserts to you, so we recommend Tsuruya Yoshinobu to not only for couples but for families too. I’ve had Namagashi countless times before, but this is the first time that I’ve ever had someone make them right in front of me! As is to be expected, the flavors and texture of the Namagashi were completely different from pre-prepared ones, and I felt particularly moved by the fact that they had specially made them for me. There are plenty of famous Japanese sweets makers in Kyoto, but ones that will give you a demonstration of how they make their sweets are few and far between, so at Tsuruya Yoshinobu you can enjoy a rare and valuable experience! I recommend going and seeing the beautiful handiwork of these confectioners sometime soon! Tsuruya Yoshinobu is a must for any lovers of traditional Japanese sweets. We were lucky enough to get to sit down and watch one of their confectioners at work. You can choose one of two traditional Japanese sweets which they change to match the season. For anyone who wants to see the Japanese sweets equivalent of a sushi master, this is a definite must see. Not only that, but the desserts we got to enjoy in the Oyasumidokoro restaurant were also fantastic. My personal favorite was the heartwarming Awa Zenzai, made from warm red bean paste and Awa （Foxtail Millet in English). The menu has English names for each item and there are photos provided too, so you can order without any problems.